Illuminate the underwater world in rich, natural color at depths up to 328' with the yellow YS-D2J Underwater Strobe from Sea & Sea. It features a guide number of 104' / 32 m on land at ISO 100; this value changes to 65' with the supplied Diffuser-120, or 78' with the supplied Diffuser-100. The flash has a beam angle of 80 x 80°, which is widened to 100 x 100° with the Diffuser-100 and 120 x 120° with the Diffuser-120. A daylight-balanced color temperature of 5600K enables the strobe to restore colors that are absorbed underwater, thus allowing for more vibrant and accurate images. Both TTL and manual flash exposure modes are available on the YS-D2J. Unlike the previous model, the YS-D1, this strobe features audible and ready-light TTL confirmation. Additionally, the rear side of the unit has a glowing panel with easy-to-read controls, which will be helpful in low-light situations. The YS-D2J is configured with a 5-pin sync cord connector and a fiber-optic port for connection to an underwater camera housing. It is powered by 4 AA Alkaline or NiMH batteries. 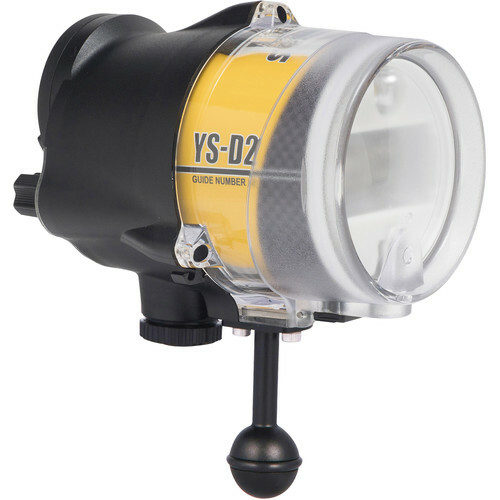 YS-D2J Underwater Strobe (Yellow) is rated 3.6 out of 5 by 5. Rated 4 out of 5 by scuba723 from Improved technology over Use two ys-d2 with TTL Y-cables for a Sea&Sea housing for a Nikon D7000. Replace two y-120's. Plus - works perfectly with current cables and attachments. Weighs less and uses only 4 AA batteries each (versus 8 on older Sea&Sea equipment). Attaching gear appears more durable and offers choice of ball or bolt to attach strobes to system. Similar, simple on/off as older equipment AND different colors on back of strobe based on whether you're in manual/optic cable/TTL mode :). minus - arrived with one of the diffusers spread so that it could not be attached. on TTL setting, color on back panel changes for light blue to dark blue when Y-cable is attached - dark blue indicates strobe is in slave mode. Somewhat confusing, but TTL works correctly. Rated 1 out of 5 by Hal from Died after 15 dives My YS-D2 died shortly after the warantee expired.? It could not be repaired, and the company did nothing to make it right.? This has happened to many others.? This strobe has gained a deservedly terrible reputation, and the company along with it. Rated 5 out of 5 by scuba723 from Lighter and better than my previous strobes - Recommend Amateur Scuba photographer using a Nikon D7k with S&S housing. Use a 'Y' sync cord w/2 strobes and TTL wire. These strobes have more power than previous strobes and used the included diffusers to 'cool' most shots. 3 items:1. Op/Ed - The 'modelling' light was not much use, even at night. I attach a separate light to my housing and it only requires that I move it up/down to center on subject. Also the modelling light isn't near bright enough for daytime and you must place strobe where you want the modelling light to use it.2. FYI - Attaching a TTL sync cord precludes the use of the 'slave' setting. 3. New/Improved - Attachment to extension arm is improved, both engineering and material. Choice of 2 mechanisms and much sturdier/stronger. (Last S&S strobe broke and had to epoxy together). Rated 5 out of 5 by Scott from Good strobe Item arrived promptly in good shape. So far I have used it for only a couple of dives, but it performed well. In TTL mode with an Olympus E-M! in a Nauticam housing, the exposures were good if sometimes a tad bright. I'll play with some of the many adjustments next time. Very happy with the purchase. Rated 3 out of 5 by Russell from Replaces D2 that leaked in cable connection. Hope the D2J is better built from Japan and not from where ever the D2 was built. Give Sea and Sea one more chance. I have one more D2 left. If it craters I'll move on to some other Manuf. can you please advise what fixing accessories are already included in the pack? Is fiberobtic cable included? No, the fiber optic cable is not included. If I use this strobe for my Olympus TG4 + Olympus Housing, will I be able to use the TTL function using just an ordinary fiber optic cable? if not, which cable should I use? Thanks! Yes. Just purchase the fiber optic cable in the length that your set up requires. I have a YS-D1 and am considering a second light with my Olympus OMD EM5/Nauticam rig: since the D1 has been discontinued, is there any reason I cannot/should not add the D-2? Go for it. The D2 is a great strobe. Which sync cord should I use to connect a Fantasea FRX100 IV Underwater Housing and a Sea &amp; Sea YS-D2 Strobe? Thanks. If your housing permits the onboard flash to work and you can see the flash from outside the housing, you can use a YS-D2. You will need a fiber optic cable and masking kit. how does the modeling light affect battery life? Can I just leave it on throughout the dive? I estimate that you will cut the battery power available for photos in half if you leave the modeling light on high throughout the dive. I conducted a test for you by comparing the mah needed to recharge the batteries. Initially, I turned on the strobes for an hour and then recharged the batteries while measuring the energy replaced. I repeated this test with modeling light on high. When recharging the batteries after using the modeling light, they required twice as much to recharge.